The build up to Mule Days in Bishop continues unabated. Kmart has taken tents, folding tables and chairs, portable showers, grills and charcoal out to the parking lot. We talked to the employee who is stationed out there, and she says they're selling much merchandise from that location. And it's only Tuesday. The Vons/Kmart parking lot is interesting. They do not mind boondockers. In fact, a large swath of the parking lot is lined out and marked as RV parking only. This is an enormous Super C, towing a very big trailer. We could hear his generator as we went by. This, however, is my favorite. Look at the roof, is that cool, or what? You can't see it due to the glare, but on the nose of the bus they've painted "Peace On You". The mules are rolling in to the fair grounds. We saw one trotting around the oval track pulling a sulky. I didn't know mules could do that. Participants are rolling in to the park as well. I love these old guys leaning on the pick up talking. Travel plans have changed once again. Up until this morning, we were heading out to Hat Creek in the Mt. Lassen area. While looking at Trailer Life, I noticed that the park down the road from where we were going to stay has a "cellular booster." 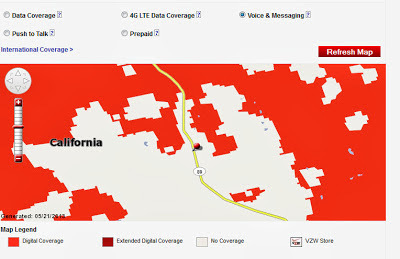 A careful examination of the Verizon coverage map reveals that there is zippity doo-dah all coverage in Hat Creek. White is the color of no coverage. The population is 302 people, so I guess they've decided it's not worth putting up a tower. So, we're diverting to Susanville and Canyonville instead of Hat Creek. Neither Jim nor I have ever dealt with the legal aftermath of someone's death. We're talking to May's trust lawyer on Friday to be schooled on what we have to do and when it must be done. I am really not looking forward to dealing with the Social Security Administration. As I previously posted, we requested an address change last April. They promised to do so, and mail us a 2012 SSA1099 within ten business days. To date, we have not received that document, which does make it difficult to file May's taxes for last year. We also do not have death certificates yet because Washington is rolling out an electronic system. Kitsap County has implemented it, unfortunately May's doctor has not registered for the system. Until he does that, we can't get certificates. The funeral home is working with him on this. It's good to have Jim back in the RV. I have limited internal resources, so having him around as a source of entertainment and company is a wondrous thing. My hat is off to the ladies that RV by themselves, particularly the ones who boondock more often than not. They truly have gumption. Speaking of the return of Jim, here is how he arrived yesterday. This is a Bombardier Q400. It's a nice plane. This is the Mammoth airport. Night landings are not recommended, and flights may be cancelled due to cross winds. See the wheel chairs? They were bringing in disabled veterans to go skiing. Yep, they're still skiing at Mammoth Lakes. Gotta love those small towns with no cell service. I was surprised when we arrived in Bluff, UT to find I had three bars on the phone!! Yipee! Only 1X data but the park has good WiFi. Hope you get to visit Lassen NP...very beautiful.